Road Rage and how to deal with it! How many times have you been cut off by some errant driver and felt your temper rise? How many times have you openly cursed someone? Do you carry a club or baseball bat in your car and felt the need to use it? Have you ever felt like yanking open the door and pounding another driver into the ground? Well, these are all instances of road rage – an increasingly common ailment – and one that has led to many fatalities in recent times. Scan the headlines in the paper and you will often come across news items of people being beaten to death or shot over minor skirmishes on the road or a fight for parking spots. Lives are ruined and wasted for no particular reason. The underlying reason for road rage most studies have shown is stress – leading to aggressive behaviour – whether you are a victim or an inadvertent instigator. 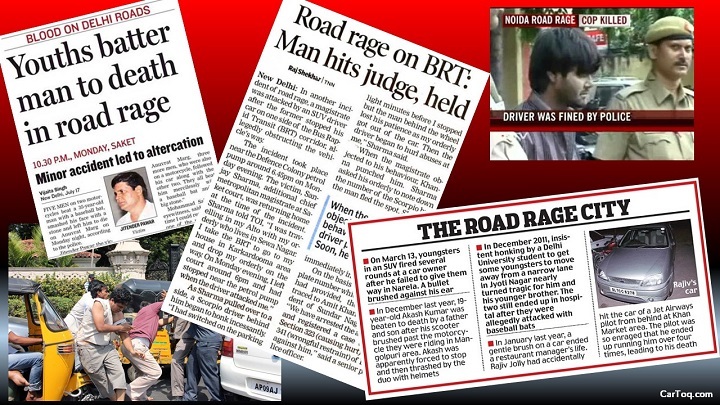 Now, it’s not easy to deal with road rage in either case. But here are some pointers that may generally help calm the situation or avoid a road rage instance entirely. Driving should be a relaxing experience. Try to stay as relaxed as possible. For that, you could resort to listening to your favourite, yet calming, music in the car to keep your mood elevated. Keep the car’s AC set at an ambient temperature at which you feel comfortable. If you are in a good mood, chances are you won’t be an instigator of road rage at least. Someone had once said offence is the best form of defence, but that’s not to be followed especially on the road. It would be better to adopt defensive driving techniques. Those signs that say “Better Mr. Late than the Late Mr.” are very relevant here. Stay within the speed limit, signal at the appropriate times while changing lanes, use your rear view mirrors and give enough allowance for others mistakes or aggressive behaviour. This is one word not many understand – yield! All it means is to just slow down a bit and allow drivers to smoothly merge instead of cutting someone off. At a roundabout, drivers coming from the right have right of way. Slow down and let them pass. If you see a car that is already about half a car’s length ahead of you signalling to cut into your lane, ease up and let it enter the lane instead of closing the gap. Still, despite your best attempts at a smooth drive, there can be others who are overly aggressive. Symptoms of such aggressive drivers include excessive honking, tailgating, gesticulating and swearing, weaving between lanes or straddling lanes, and speeding up suddenly and braking sharply. The best thing to do in such situations is to just let such crazy drivers go and hope karma catches up with them – it’s not worth your time and blood pressure trying to teach them a lesson or challenge them. Divert your mind, think of your friends and family perhaps to quickly calm your nerves. However, if you inadvertently cut someone off or bump into them accidentally, keep your calm about you. The first thing to do is to smile and apologise. This can prevent a situation from escalating into a full-blown confrontation. If the other driver is being overly aggressive, it would require a tremendous amount of self-control to not react. Offer to help or reach an amicable decision. But if the other person refuses to back down, the only way out is to call the police and let them deal with it. If you are faced with a situation where you have a driver tailgating you or trying to cut you off intentionally, the best course of action would be to just stay calm and drive on – preferably to the nearest police station or picket. It would be wise to get help in such situations, because some drivers can be overly aggressive and can even turn violent. Do not say or do anything to instigate such drivers. Swallow your pride, stay calm and drive on. The bottom line: Do unto others what you would have others do unto you. Share any ideas you have about dealing with road rage in the comments below. Drive safe!